Let's start off with the obvious question at hand: Why am I doing this? 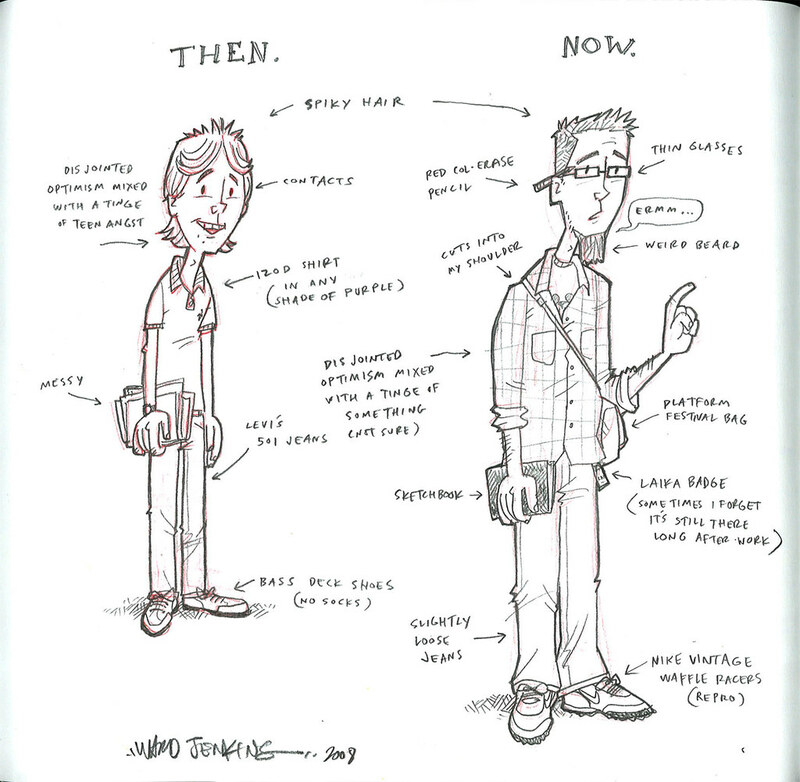 On top of my full time job as an animation director at LAIKA/house, along with my blogging duties on The Ward-O-Matic, not to mention my permanent titles as husband and father on the personal side -- why on earth would I want to forge through in making an animated film? 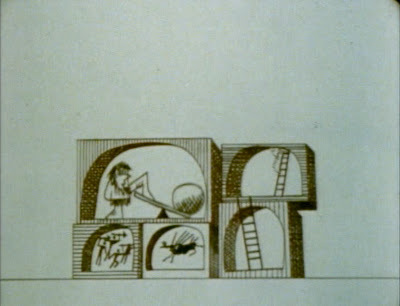 There is a great short film by legendary designer and filmmaker Saul Bass called WHY MAN CREATES -- it won an Oscar for Best Short Film in 1968 -- about this sort of thing. 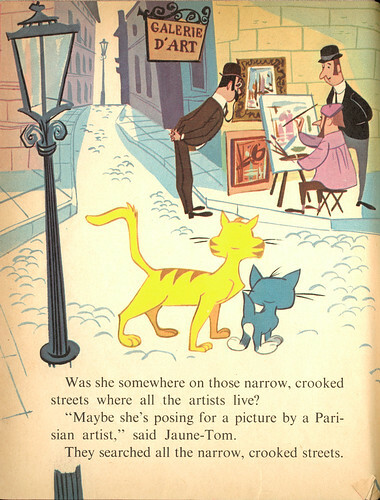 Bass explores several venues regarding the issue of creativity in this film. The main jist of WHY MAN CREATES is that there is a desire by mankind to emphasize the individual, to stand out from the typical crowd and make a mark upon this earth. 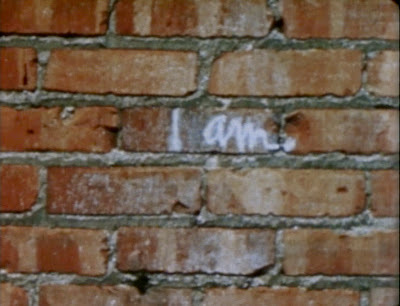 As human beings, it is in our blood to establish who we are and where we've been. From the ancient cave drawings to Greek temples to towering skyscrapers -- throughout entire generations, all of it is basically saying the same thing: I WAS HERE. The most simplistic and base ideal known to man -- identity. Knowledge of self, knowledge of awareness, knowledge of existence. And out of that self awareness, man creates. For the Artist, this desire to create consumes his/her entire being. It is an uncontrollable urge that makes him want to record his surroundings in ways only he knows how. That's pretty much the academic take on it. Honestly? I just want to work on something that I can call my own. To create characters in my style, and animate them however I want. To be able to work on something where I don't have to answer to anyone. I'm calling the shots here. No art directors, no producers, no creative directors to answer to! Freedom. Liberation. Joy. And once it's done, there'll be such a feeling of accomplishment you can't even imagine. I look forward to that moment -- it's what will drive me throughout the entire process of making this film. 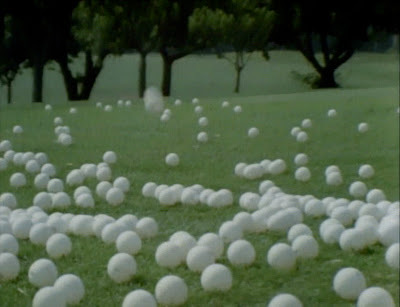 One lone ping pong ball stands out among the crowd in a segment of WHY MAN CREATES titled, "A Parable." 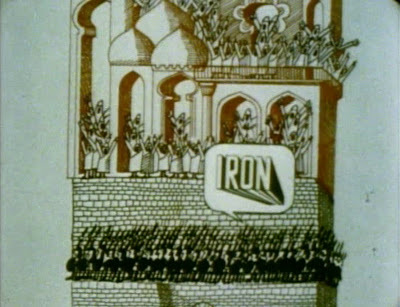 The film is split up into eight different segments -- the first one, "The Edifice," features a great bit of animation by Fred Crippen who used to work at UPA back in the 50's. It contains one of the longest pans in animation history, I'm sure, as the camera pans up, up, up, through the centuries. 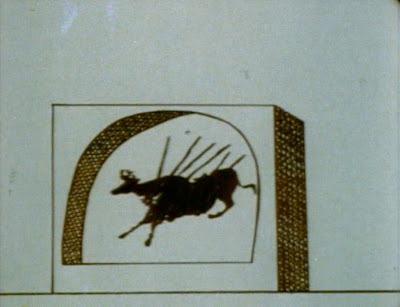 We witness the basis of all our creative output by a single cave drawing of a hunt: a recording of an event that sets forth a chain of events that ultimately ends up at the top of an enigmatic column. There's some great humor and satire in the piece, setting the pace for the rest of the film. Saul Bass finds a great balance in this film between the humorous pieces and serious debate about the creative process in general. In one section, we hear several scientists and doctors talk about the various projects that they've been working on for years and how it's lead them to dead ends. The voice over then asks each interviewee the big question: "What are you going to do now?" It's wild to hear one answer rather sullenly: "I don't know." 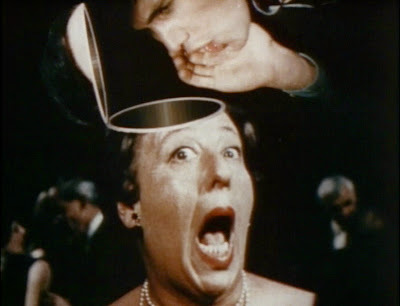 In the section "Fooling Around," Bass stops the film to poke fun at a woman being interviewed. Here's what Bass thinks of critics. You can order a copy of WHY MAN CREATES directly from the Pyramid Media website. A word of caution, however -- it's mighty pricey. Little bit of trivia about this film: a young, budding filmmaker was credited as the camera operator. Who might this filmmaker be? Why, none other than George Lucas. 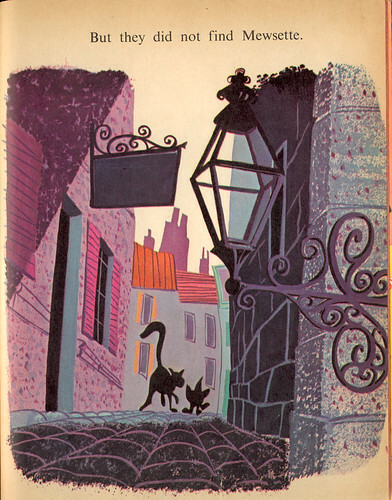 More on Saul Bass's career HERE. Nicely designed site utilizing some of Bass's graphic elements HERE. I've given it much thought about whether or not I should share my thoughts during the course of production of my short film here on this blog. Problem is, I can never find enough time to work on the thing. It's beginning to bother me, but I'm trying not to let it get me down. I did start up a production blog for the film, but don't bother looking for it. It's private and I've only invited a few family members. Once I get the ball rolling with actual artwork to show, maybe then I'll make it public and share with you all the concept of what I've been working on all this time. In the meantime, just keep checking the Ward-O-Matic and maybe I'll drop a few hints about the project from time to time. I'm sad to say that perhaps the biggest influence in my life as an artist has passed away. 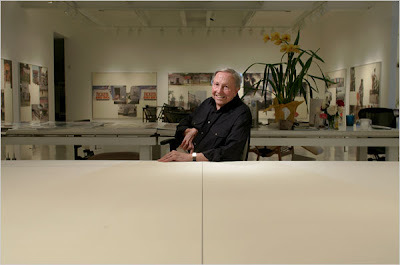 Robert Rauschenberg died yesterday at his home in Captiva Island, Florida. He was 82. BR: It's interesting that in all your years of producing new directions in your art, you have never gotten into death imagery. A great deal of risk but not death. Is that something that you ever think about? RR: Not often. I have always said that life has nothing to do with death. They're two separate things, and that's the way it ought to be. If that's innocent, so be it. Innocence is not like virginity. Virginity you can have only once. Innocence you have to nourish every day. "Here go, daddy. make a wish!" Ezra hands me a dandelion. We are sitting on the steps in front of a house where Ava is taking a drama class. It's a quiet Saturday morning. "What should I wish for, buddy?" I laugh at this. Downstairs is where I've been working on getting my workspace in order. Right now, there's a large desk with my animation desk set up, a bookcase filled with books, and lots of 'stuff' all around, ready to be organized and placed in shelves, drawers, tables. I closed my eyes, took a breath, and wished for 'stuff'. 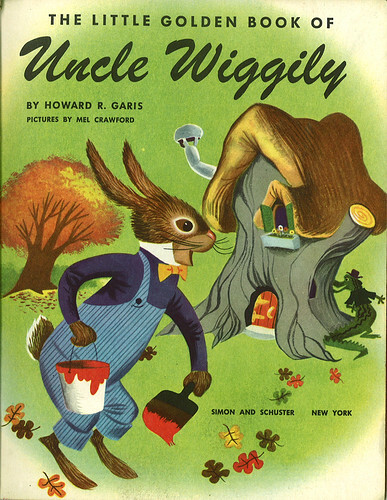 Uncle Wiggily, by Howard R. Garis. Pictures by Mel Crawford. 1953. Let's just say that Mel Crawford is THE MAN. This is a fantastic LGB, with gorgeous illustrations by Mel. 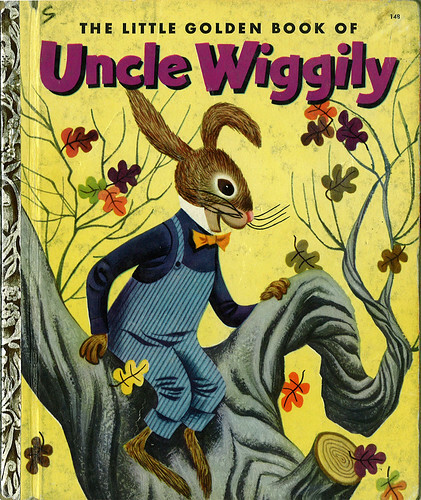 One of my favorite children's books in my collection. Oh, and yes, this is the book that I'm holding in my icon image over there on the right. For the record, Mel Crawford is still alive and doing well. He's got a blog, even. Here's his official site: MelCrawford.com. 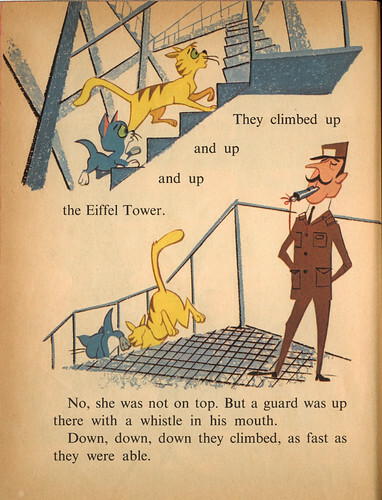 He's listed on this site for Little Golden Books illustrators: Collecting Little Golden Books: Illustrators - Authors. I love how he went completely yellow for the main background color, instead of white. Nice overall tone here. This is the last page. Lovely stuff. What a jolly guy. 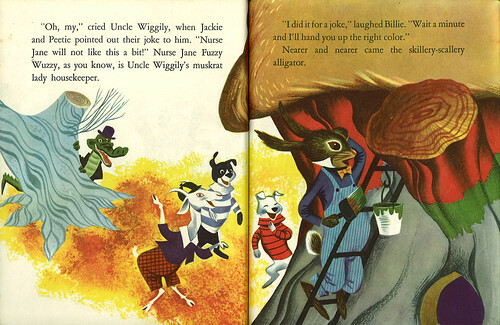 Here's the full endpapers for Uncle Wiggily. In excellent condition. Well, I should say that I Photoshopped out the name that was written there on the left. Thought that everyone should get a nice glimpse of this artwork. Not sure who did this, but it's wonderful. I've started up a new Flickr set: My LGB's. I'll be adding more to this set shortly. Stay tuned. And oh, yes. I have to plug my Flickr group once more...if you like this sort of stuff, definitely check out The Retro Kid. 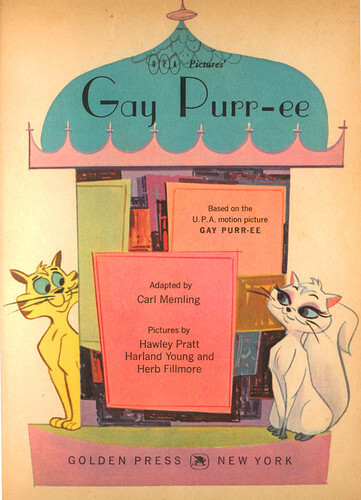 Gay Purr-ee, Adapted by Carl Memling. 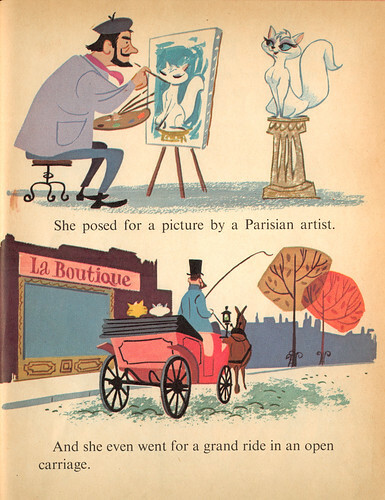 Pictures by Hawley Pratt, Harland Young and Herb Fillmore. 1962. 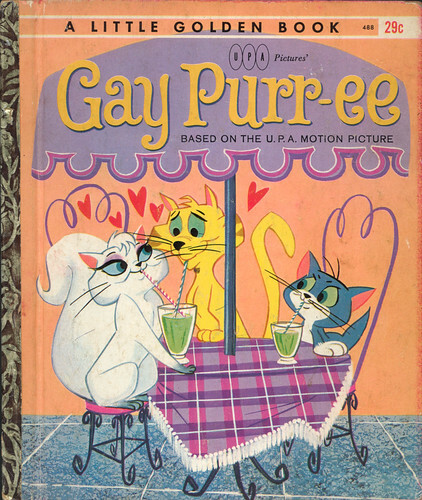 This Little Golden Book is based off the UPA motion picture, which was released in the same year. I was taken aback by this book since I never knew that they had even made a book for the film. And strangely enough, this is not the only one. 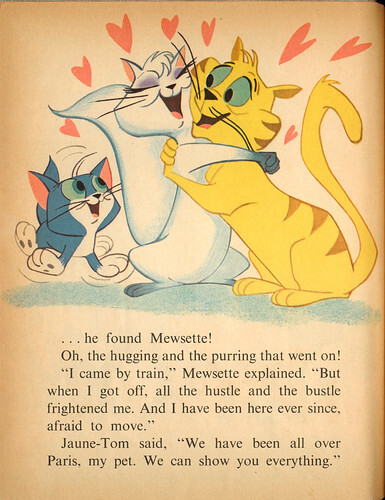 There was another LGB published, but features Mewsette's storyline. Click here to check it out. 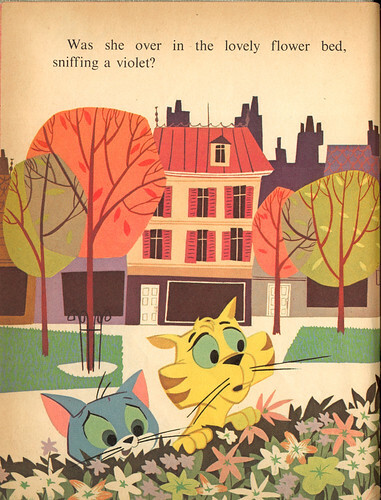 Hawley Pratt was Friz Freleng's layout artist for many years, working at Warner Bros. and DePatie-Freleng. 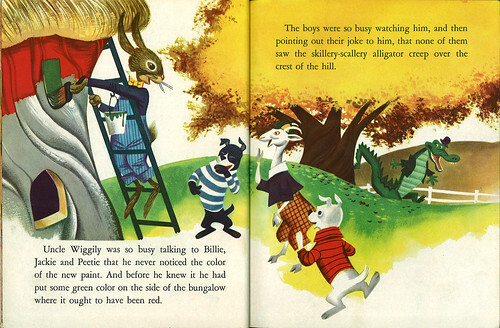 I should say that Hawley should not be confused with Pete Hawley, who was a well-renowned illustrator. Harland Young is still alive and paints for a living. Not sure if Herb Fillmore is still alive, but I did find a few prints of his paintings (scroll down a bit). 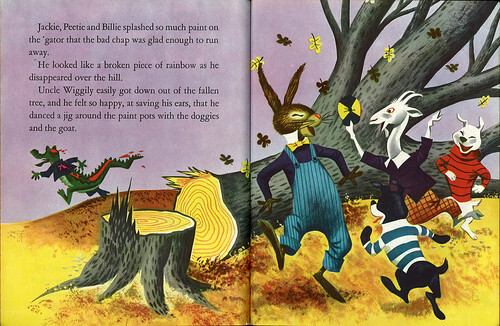 The colors are a little washed out on this book, thanks in part to both age and my terrible scanner. I'm currently scouring the market for a decent one. Oh man, I love those trees. Nice work on this page. I love that guy there. 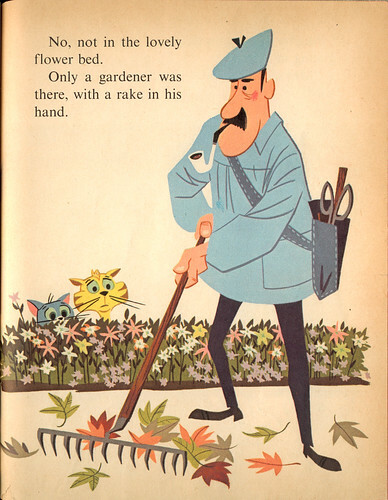 Tell me that all French gardeners dress and look like this, please? This is a nice page here. Love the layout and deep colors. More fun vintage goodies like this can be found at The Retro Kid. I've got another LGB ready to upload and post about probably later on tonight. Stay tuned. You'll dig it. Very fun. 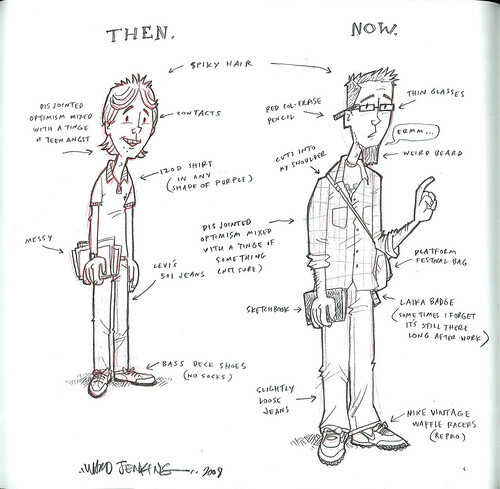 There's a meme going around: Draw yourself as a teen. I like it. Here's my take. This is me, circa 1984, I guess. The spiky hair with sorta wings and flippy hair in the back was big. At least I was lead to believe it was. I always seemed to be a bit behind the times, if I recall. The Izod shirt was a standard for me, though. And the Levi's 501 jeans. 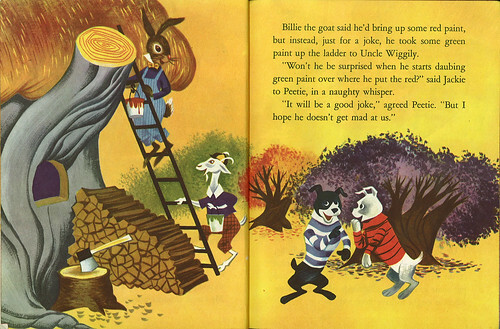 Back then, there were no 'boot' or 'baggy' or 'straight' cut -- just regular cut. The shoes I wore out constantly were those brown leather Bass 'deck' shoes. No socks. Dork! Care to take a closer look? Here ya go. Nowadays, I don't really follow any sort of trend, however I would have to say that these dark narrow frames seem to be worn by everyone. Or maybe they used to? 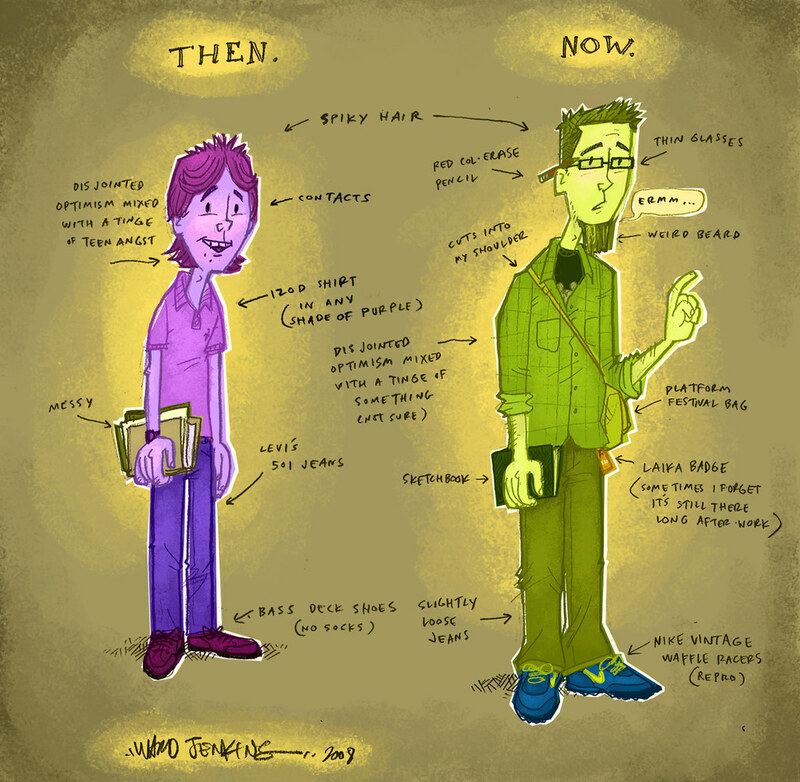 Again, me behind the times. I wouldn't know. But oh, I do love those Nike Vintage shoes. Yes, I do. Me thinks I should've put color to this illo. Maybe next time? 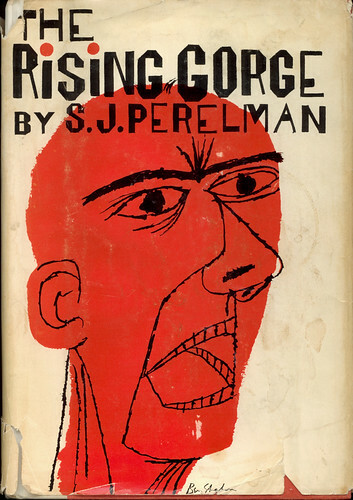 The Rising Gorge, by S. J. Perelman. Cover art by noted artist Ben Shahn. 1961. Love me some Shahn. I found this book at a flea market shindig in Aurora, OR, of all places. I saw the unmistakable Shahn type on the spine and grabbed it immediately. More about S. J. Perelman. Thought it seemed fitting to post this today since I'm going in for either a root canal or tooth extraction later on. As crazy as it sounds, I'm hoping for extraction -- it's a wisdom tooth so I'm figuring that I don't really need the thing and I'd much rather get it over and done with and not have to come back for more dental work. But what do I know? 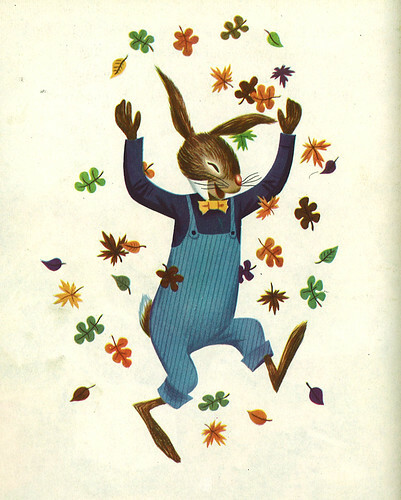 Finally got around to scanning some fun vintage children's records. I have to laugh every time I read on the cover that these records are "nonbreakable" or "unbreakable." Never underestimate the power of a 2 year-old, people. Seriously? Kids that age are tough. If something doesn't break right away, they'll find a way. Believe me. Anyway, some of these 45's came my way via the wifey. She'd buy one here and there and then suddenly, I'd have a nice little collection of cool old records. A few shown below were actually in her booth when she sold vintage items for a short while. Don't tell her, but I would secretly "re-own" them by stashing them under my shirt and put them safely away. Couldn't stand to see them leave my clutches. Does that make me a bad husband? Don't answer that. 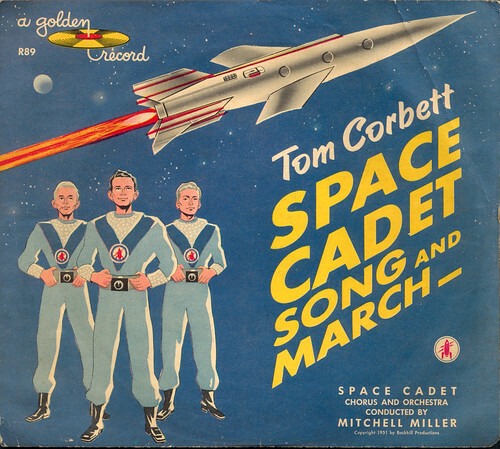 Tom Corbett: Space Cadet Song and March, A Golden Record. 1951. No mention of illustrator. Gotta love sci-fi of the 50's. 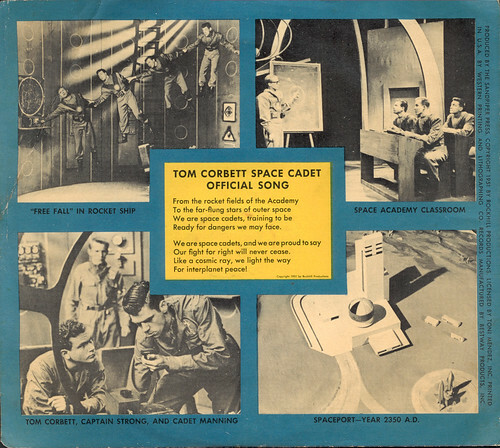 Michael Pinto of Fanboy.com posted about this record recently, sharing a little bit of insight about Tom Corbett: Space Cadet, which was a TV show that aired from 1950 to '55. Thanks for the mention, Michael! 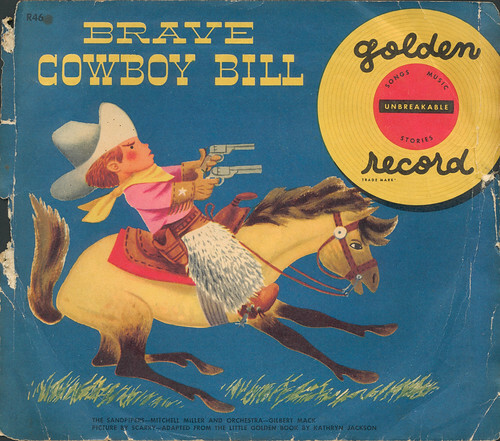 Brave Cowboy Bill, A Golden Record. 1950. 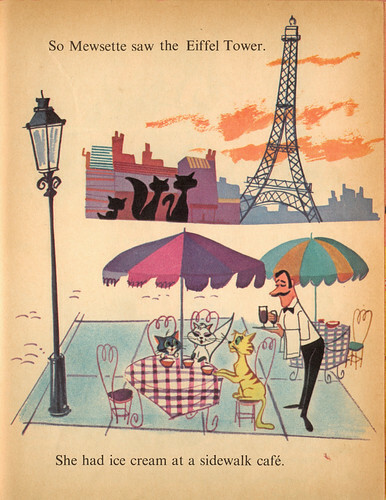 No mention of illustrator, but looks like JP Miller. Any suggestions? 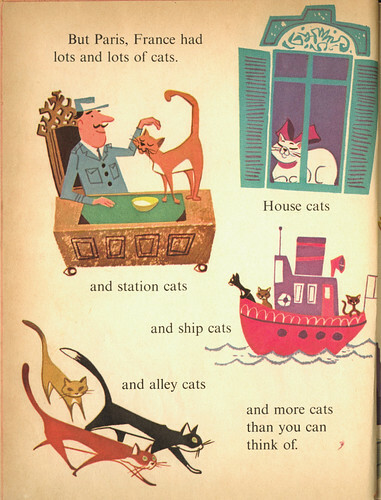 Aurelius Battaglia, perhaps? The following two are from Columbia Records, where Alex Steinweiss created the concept of the album cover. 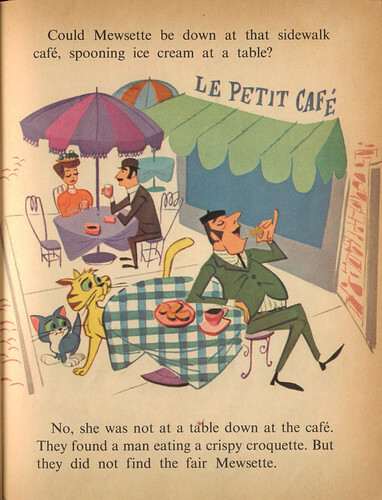 These two have some sort of Steinweissian style to it, but there's no telling, since no illustrator credit is given. Good grief, Mr. Steinweiss is still alive! Give 'em a pound. 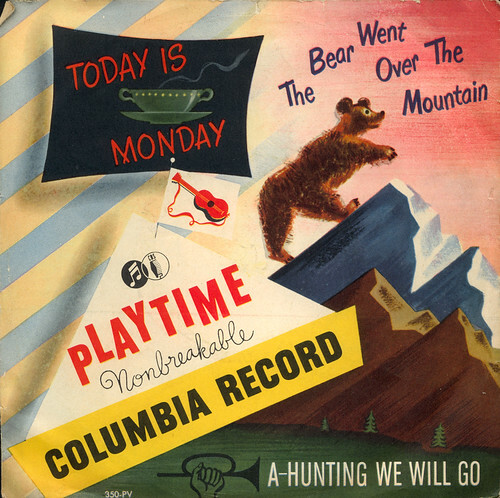 The Bear Went Over the Mountain b/w "A-Hunting We Will Go" and "Today is Monday (Soup Song)." Playtime Records. 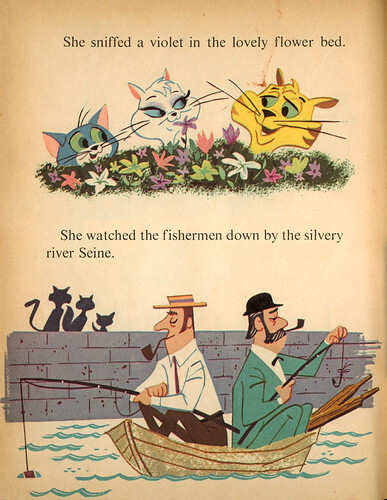 No mention of illustrator nor copyright date. The center labels on these two 45's sport some nice illustrations. I'll have to scan them in some time. 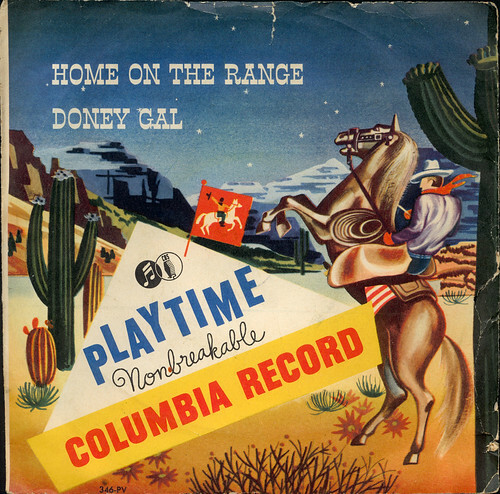 Home On The Range b/w "Doney Gal." Playtime Records. 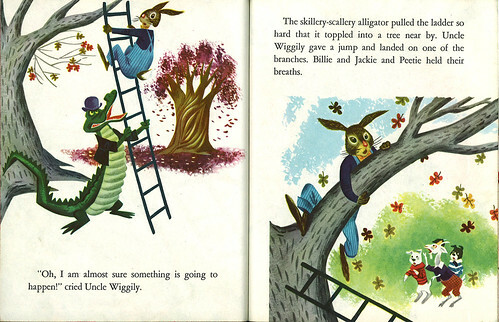 No mention of illustrator nor copyright date. 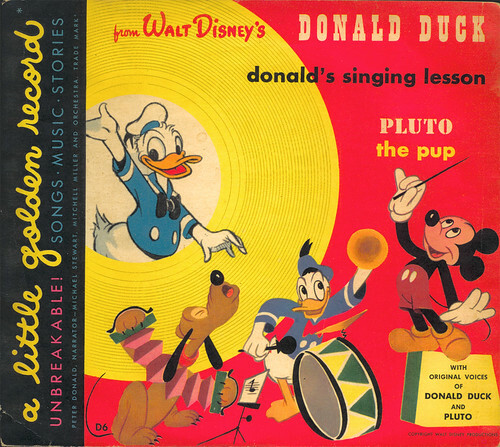 Donald's Singing Lesson b/w "Pluto the Pup." A Little Golden Record. 1949. 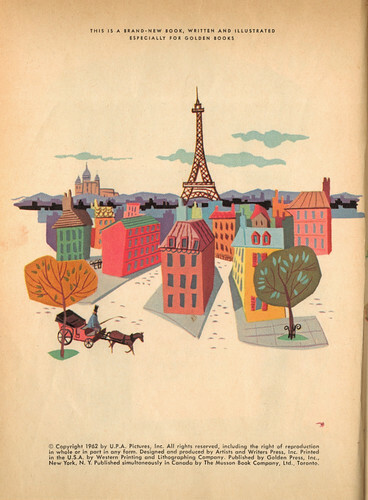 Illustrations credited 1948, '49 to Walt Disney Productions. 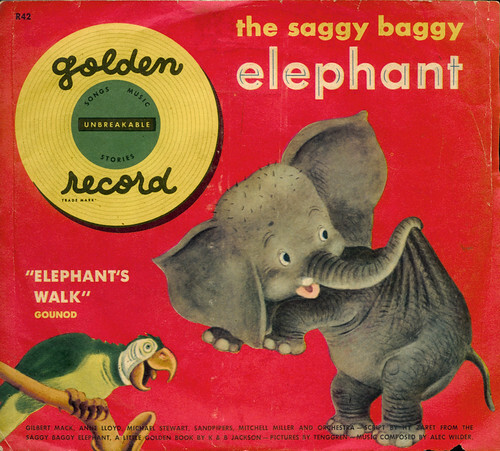 The Saggy Baggy Elephant b/w "Elephant's Walk." 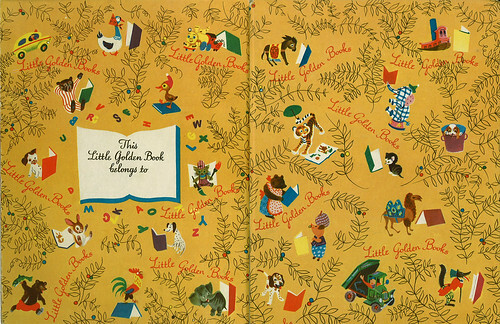 Little Golden Records. 1950. No mention of illustrator, but we know that this is based off the book by Gustaff Tenggrenn. 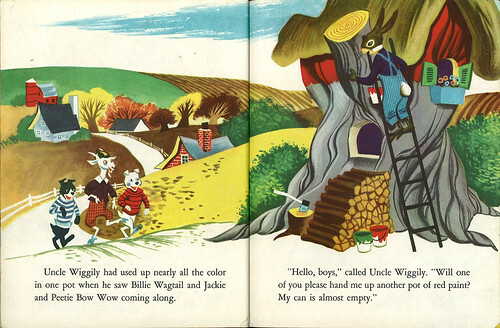 Classic Little Golden Book. 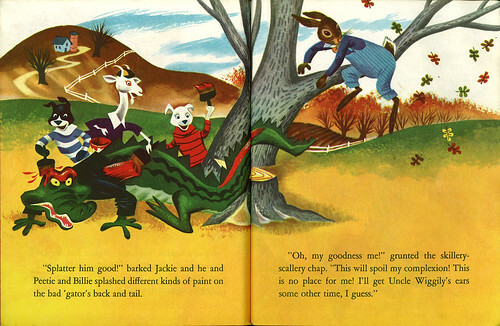 We had this book when I was a kid. 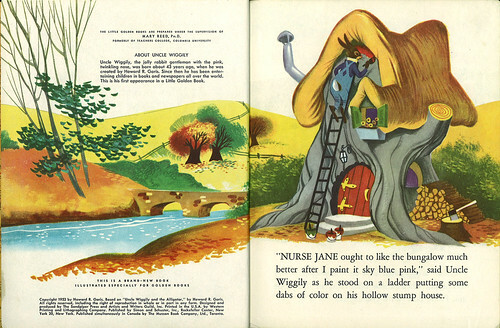 One of my earliest memories involves The Saggy Baggy Elephant, wherein Mom would record herself reading the book for my sister and I. We then could take the tape and read along while she did housework or whatever. She did this with several of our favorite books -- oh, how I wished we still had those tapes. Mom, any idea where they could be? I need to post more about things that interest me, that intrigue me, that give me a chance to look at things in a new light. I've got several posts in draft form that are just waiting to go live, but I can't seem to find the time to tweak the content. I'll see what I can do to get these little tid-bits of thought and inspiration out in the open. Bats for Lashes: "What's a Girl To Do"
An interview with the director about making the video. 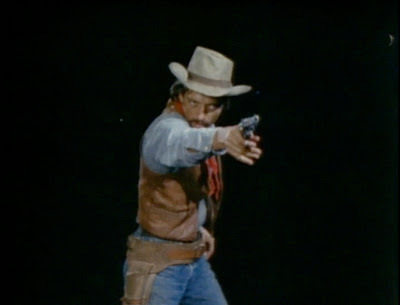 When I read about projects or film shoots that went awry, where things had to be re-shot and redone, I don't bat an eye. I nod and think to myself, "yes, been there, done that." It's all part of the artistic process. Sometimes you have to redo everything in order to see your vision through, even if cameras, computers, or the most basic technology happen to work against you. One Got Fat, a bike safety film from 1963. 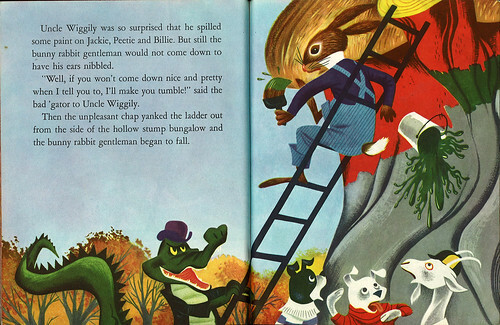 Directed by Dale Jennings and narrated by Edward Everett Norton, of "Fractured Fairy Tales" fame. 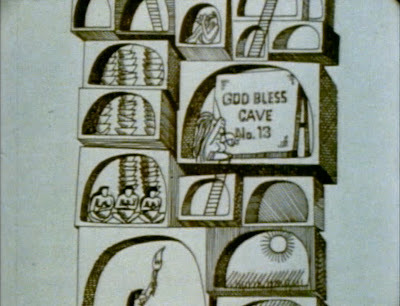 You know, we need more safety and instructional films like this. Freak the kids into submission.